Sunil George (29) is not from any IITs or IIMs. His father had studied only till 4th standard and mother only till 8th. Sunil himself got only 58% marks in Class 12. But Sunil has cleared the toughest exam in the country – UPSC Civil Services Exam – and has made the name of his village, Paisakkari, known to the outside world. Sunil hails from Paisakari – a village located in the western ghats bordering Kerala and Karnataka. He is from a family of five. His parent’s primary source of income is from agriculture. He studied in regional language (Malayalam medium) in school, but that didn’t prevent the entry of this energetic self-reliant young man into Indian Civil Services. His optional subject in UPSC Civil Services Exam was Sociology. Sunil George secured an all-India rank of 587 in UPSC Civil Services Exam 2015. There were only less than 600 vacancies in general merit. The total number of applicants in 2015 was 9.5 lakhs, which means that there is only a 0.06% chance of selection if the candidate belonged to General Category. If you read Sunil’s complete story, you will realize the value of this rank. Fourth attempt: Clearing Prelims for the first time! It was on his fourth attempt that Sunil achieved this feat. He had not cleared even Prelims in his three previous attempts. But when he did, he did it in style, clearing Prelims, Mains, and Interview at a stretch. Though known among his friends as ‘Facts Guru’ and as an expert faculty for various competitive exams, Sunil says, he had failed even to get a selection in the LD clerk exam before. But, not in the ‘IAS exam’ this time! 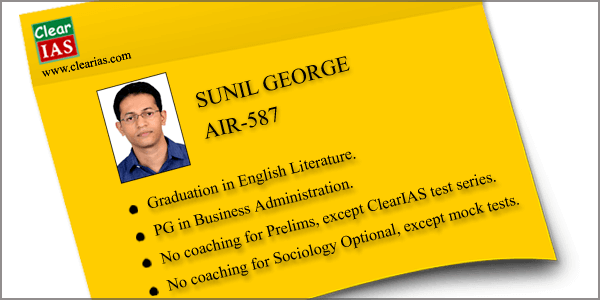 For Sunil George, life is all about struggle and his IAS exam preparation was no different. Sunil had a break in his studies after 12th and graduation due to family constraints. He had done various marketing jobs to finance his graduation (English Literature) and post graduation (Business Administration). There were a lot of financial difficulties. He had to support his family. 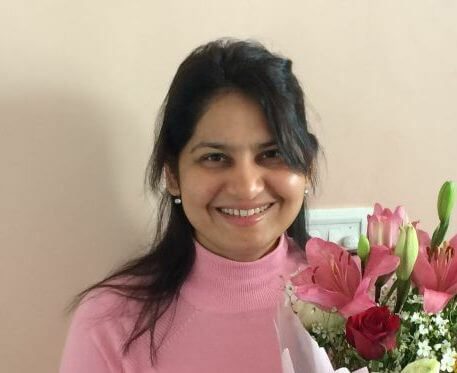 There was no permanent job – he had quit his jobs at HDFC bank and at an Engineering College, with his strong belief that Civil Services is his area. It was his self-belief and strong motivation which finally paid off. Sunil was into serious preparation for IAS exam from 2013 end, but his parents were not fully aware of the hard work their son was making. In fact, they came to know about Sunil’s perseverance when he told them that he is going Delhi for ‘IAS interview’ in 2016 April. He worked as part-time faculty in many coaching institutes in Kerala. Whenever he got opportunities he took classes – often for 6 hours or more at a stretch. After his role as a faculty, he was quick to be back to his role as a student. He says, he used to spend 10-15 hours for studies, whenever possible. Sunil badly needed a government job, and he finally got one but just after Prelims – as Programme Manager at Additional Skill Acquisition Programme (ASAP), Govt of Kerala. While most of his peers where studying for mains, he was shouldering the responsibilities of a very hectic job. It was tough to prepare for UPSC exams continuing in the job. But he had to. There is more to Sunil’s inspirational story which makes it similar to ‘2 States’. Sunil had found his lady luck when he was doing his MBA at Ranchi. She stood with him throughout all the difficult times of him. Sunil says that without the support of his lover, this achievement would have never been possible. Sunil thankfully remembers the help done by his friends, teachers, and superiors to help him achieve his dream. In particular, he has mentioned the names of Arun Sir, Remya Roshni Madam, and Jeevan Sir. Sunil also credits his success with the effort of ClearIAS.com website, particularly ClearIAS Prelims Online Test Series. He didn’t attend any classroom coaching for prelims. It was mostly self-study. Read his testimonial. The prelims online mock tests by ClearIAS were of great help to me. I was able to evaluate my performance after every test. It allowed me to understand my weak areas, work more on them, and improve upon them. The rework on the previous year papers as given by ClearIAS can make a beginner understand the pattern of the UPSC questions. That will help candidates to target specific areas which otherwise many will forget to do. Sunil says that there are two important days in a person’s life. One is the day on which you are born and the other you learn ‘why?’. But when you get the answer to the ‘why question’ put all your heart to achieve it, and you will. Sunil writes poetry and is a basket ball player too. He can speak 5 languages, including Spanish. 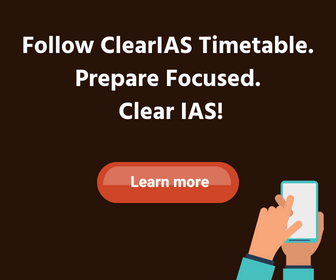 Sunil George, as part of ClearIAS UPSC Toppers interview section, has explained his preparation strategies for our readers in a detailed interview. You can check the same here. First thing I would like to know is the books u followed for sociology and the approach u made for it…. congratulations sir! seriously hats off to you….plz share your stratergy of preparation and how did you manage studying while working? You deserve it sir …. This is my first post, though I have been follower of your website a year long. I never dared to attempt the UPSC. After reading the background of MR. Sunil sir, the confidence in me multiplied and I committed to give an attempt upcoming year. ClearIAS website have been very informative and motivational. In future would like to take the test series. Can you help me with previous year papers and test series? This would be another big HELP by you. Its an honor to be your student.wish u all the best. Inspiring story for ias aspirants. I would like to know about your exam strategies.